Valve has finally admitted that CS:GO has a hitbox issue that it is working on. Ever since being released back in 2012, fans of Valve shooter Counter-Strike: Global Offensive have noticed something... odd, about its hitboxes, the system used to detect exactly where your bullets hit your target. Recently, the following .gif was posted on reddit, featuring the almost comically broken hitboxes. It skyrocketed to the front page, finally prompting a response from Valve. Valve's Matt Wood replied to the thread with the very terse: "It's being worked on. We don't have an eta." And that was all. Fans were elated that Valve finally acknowledged the issue after three years, but were disappointed that no more information was offered. 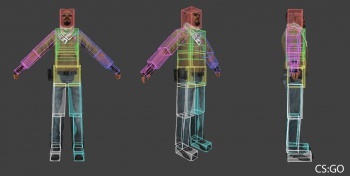 Prior to the game's release, back in March, 2012, Valve posted a blog post explaining that hitboxes in CS:GO would be considerably smaller than their Counter-Strike: Source counterparts, in order to ensure that the accuracy of your shots actually mattered. Well, it looks like in that process, it may have made things a little... too accurate, with the system refusing to register dead-on hits for seemingly no reason. We've reached out to Valve to see if they can offer us more information, but don't expect to hear anything until "Valve Time" dictates a response.